Today I want to offer my honest Pineapple Clothing Company review because I feel the need to share my experience with the company. I wasn’t able to find many reviews of Pineapple when I was trying to decide whether or not to order from them, so hopefully this post will help someone out. I was pretty excited when a representative from Pineapple Clothing reached out to me a few weeks ago and asked if I wanted to be a ‘brand ambassador.’ I wanted a new pair of yoga pants, so receiving a discount code was appealing! 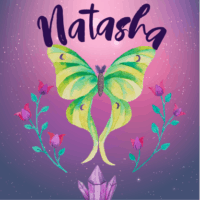 After placing my order, I would be able to join their affiliate program and offer a discount code to my readers & followers, which was also nice. I love making free yoga videos on YouTube, but YT advertising doesn’t pay much of anything, so the opportunity for a few affiliate sales sounded great. I also liked that they’re made in the USA. My husband wasn’t so sure about the purchase, but I told him I really didn’t want to just wear the exact same pair of pants in every single video and that just a handful of affiliate sales would recoup the cost of the new pair of pants. Eventually I decided to order both a shirt and a pair of pants. Based on reviews available on their site and the sizing measurement chart, I decided to go with a size XS for the leggings. Several people commented that they ‘ran large’ and were super stretchy, and I currently sit right on the given upper measurements for the XS. I was worried that a small would be too loose and slip down, a problem that one person reported having with the leggings. When my order arrived, I really liked the cute pineapple mailer. I used decorative tape and mailers for years with my Etsy shop and I think it’s a nice touch. When I unpacked my order, I was initially very surprised by how synthetic-y the leggings felt. I know that they are a synthetic material, but several people had commented that they were “soft and buttery” so I expected them to feel softer. I was, however, pleasantly surprised by how comfortable they felt on my legs. Things were looking and feeling good! As I do with any pair of leggings, I stood in front of a mirror, did a few squats, and bent over. Yikes! The black leggings suddenly went very, very see-through. That’s not what I want for a YouTube video! I promptly emailed the company to ask for an exchange authorization number. They wrote back impressively fast, especially considering I emailed them at 8 pm (right after my baby went to sleep). In all, 2.5 hours elapsed between when the mail arrived and when I was able to email the company, which seems pretty good considering my husband was away and I was solo parenting. The leggings fit very well in the waist, they just didn’t work well for my muscular hips/thighs. I lift weights and CrossFit regularly, so I’m not as “long and lean” as many yoga teachers. I was a little concerned that a size S might fall down or gap funny at the waist, but I knew that transparent leggings weren’t going to work for me. I carefully packaged the leggings according to direction (even making sure to fold along the still visible fold lines!) and mailed them back the next day. Again, they wrote back very quickly. I wrote back explaining, truthfully and politely, that I had only worn the leggings for about 5 minutes. The squatting and bending over I did in them is exactly what I would have done at a brick and mortar store, plus I’d have walked around to find my husband and show him what the leggings looked like. I also explained why I was disappointed. While my husband is completing his degree and seeking employment, we are essentially living on savings. His income from one weekend a month in the Reserves and what I make online does not cover our monthly expenses. Now I’m stuck with a pair of pants I can’t used and I don’t feel comfortable recommending Pineapple Clothing to my followers or using my affiliate link. I actually had trouble sleeping that night because I was so upset. I was upset that I’d convinced my husband to let me buy these leggings that I can’t really use. I was upset that the company basically called me a liar. I was upset that they never even wrote back again. My sister is slightly smaller than I am and a runner instead of a lifter, so I guess I’ll see if she wants them. 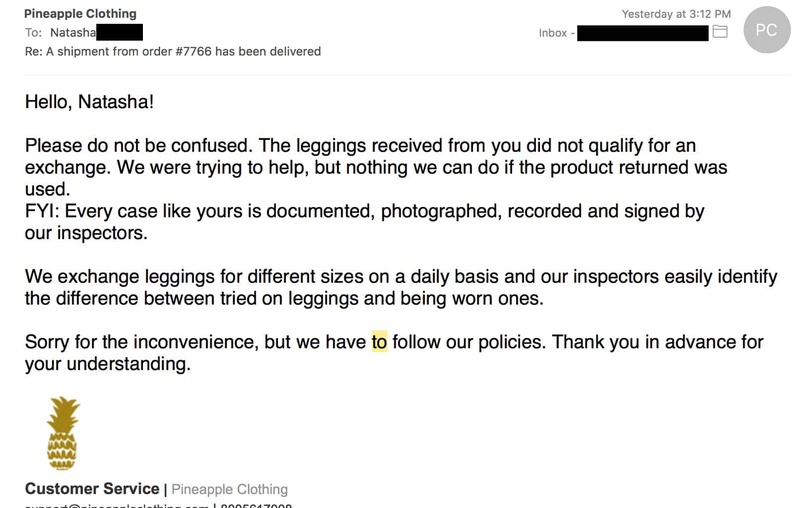 Based on my experience, I recommend caution if you’re considering ordering from Pineapple Clothing Company. If everything and gone well and the leggings had worked out for me in their original size, I’d say they’d be worth the discounted price, but probably not the (at time of writing) full retail of $65. I feel the same way about the shirt. It’s cute, but the full retail price is a bit much considering how many fun/cute shirts there are in the world these days. If you can catch a sale, or feel like using someone’s discount code, have a less athletic body type, and don’t need any returns/exchanges, then you might have a decent shopping experience with Pineapple Clothing. I do like that their clothing is made in the USA and I appreciate their prompt communication, when they replied. I just can’t really recommend a company who firmly believes that 5 minutes of trying out an item constitutes “using” it to much for a return. If what I did somehow wore the item out to an un-resell-able point, then they probably wouldn’t hold up to much use. If you’re looking for cute yoga leggings, there are lots of options. Pineapple’s patterns aren’t as good or the material as soft as my absolute favorite yoga leggings from Liquido Active. The designer prints from Liquido cost a little more, but on clearance they can cost less so it evens out. I’ve never worn a pair of LuLaRoe leggings, but my understanding is that they cost quite a bit less, so they’re an option if any of your friends see them. I’m wearing Liquido pants and shirt in this image, if you’re curious to see what they look like. You can find me in these leggings in many of my videos, too! The purple shorts in the image above are also Liquido. I’m not an affiliate with them, so I don’t get any benefit from recommending them – they’re just a company/product I really like. 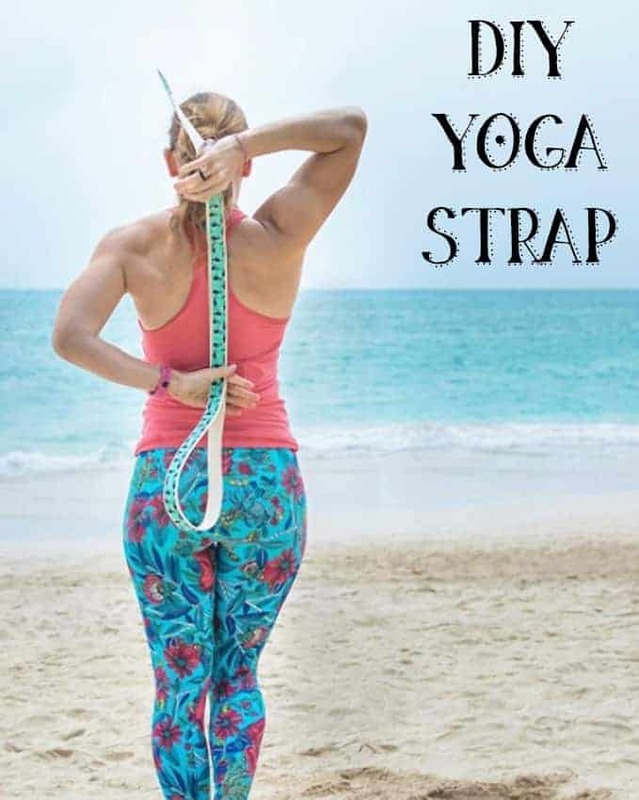 If you want to see the yoga strap tutorial, it’s right here. If you want to support individual artists, consider shopping leggings on Society6. You can use this referral link for $10 off your first order so you don’t have to wait for a sale! You can also find leggings on RedBubble. They tend to cost in the ~$40 range. Then, of course, there’s the print on demand classic, Zazzle. In my experience, Zazzle’s quality is a little bit less than Society6, but I haven’t tried leggings from either site. If you have, I would love to know your thoughts! 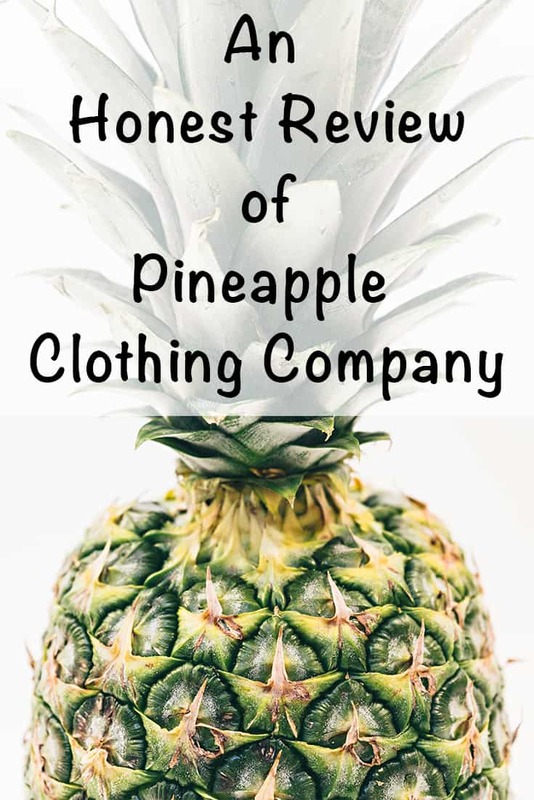 I truly hope that my Pineapple Clothing Company review helps some people out! I’m not saying absolutely don’t order from them, but do proceed with caution and consider your purchases final. I know their email says they make exchanges every day, but that wasn’t my personal experience. If you do make a purchase and need an exchange, I sincerely hope you have a better experience than I did! So so glad I found your review. Several accounts of pineapple contacted me too. I guess they contact everyone who posts yoga pictures in instagram. Thanks for writing. I understand how it feels to purchase something you can’t wear, i experienced it several times especially now that online shops are so many. So this honest review really helpful us out all yogis and customers. I’m not entirely sure of my current measurements and I can’t find a cloth tape measure! I have smalls from Liquido. I’m 5’2″ and was a muscular 132 lb when I ordered, currently 122. They fit well when I got my pants and leggings and they still fit fine now. The material for the pants is very stretchy!